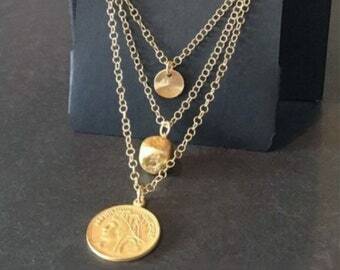 This gold coin bracelet is an updated classic that is perfect to wear everyday. The double strands of gorgeous matte gold plated oval curb chain make this bracelet a standout, and great to layer with other bracelets. You can dress this bracelet up or down, depending on the occasion. Wear it with a sleek dress for a special occasion, or with your jeans and a denim shirt. Timeless and perfect for ladies of any age, this multistrand bracelet will be well loved and worn often! 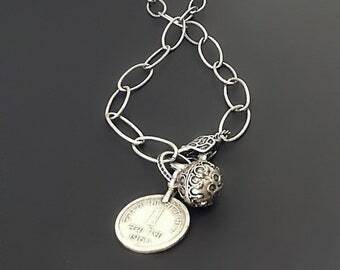 Love my new coin bracelet! So pretty and unique. Great seller and super fast shipping!